Free filing is potentially available to tens of millions more taxpayers this year than last year. If you prepare your own income tax returns, one of the best ways is with online software. The best-known providers, TurboTax, H&R Block and TaxAct, offer quality products designed for ease of use on your computer or mobile device. And all three offer free preparation and electronic filing of federal and state income tax returns if you qualify. One way to do this is through the Free File portal on the IRS website. This is the preferred method if you can find a good fit within a frustrating patchwork of arbitrary qualification rules. Software provided through this program will prepare all the most common forms and schedules, such as Schedule C for business income and Schedule D for capital gains, without requiring you to pay for an upgrade (see list of available forms). Also, when you use the IRS Free File program you’ll be shielded from some of the ways these software providers try to get you to pay for enhancements, loans or other offerings. But there’s an alternative. Free filing may still be available even if you can’t use the Free File program. If you go directly to the websites of these software providers, you’ll find another offer of free service. This one isn’t subject to the quirky Free File restrictions on income, age and other characteristics, but is limited to people with simple returns. For example, with income above $66,000 you can’t use Free File, but you may be able to use one of these free offers if your return doesn’t require any special forms or schedules. Bottom line: If your return includes anything requiring a special form or schedule, such as capital gain or business income, you may be able to prepare it through the IRS Free File program but not through the software companies’ direct offers. If your income is above $66,000, the IRS Free File program is not available but you may be able to use one of the direct offers if your return is simple enough. From 2017 to 2018, the number of itemizers will drop by about 60%, or nearly 30 million taxpayers. The tax law that took effect in 2018 greatly expands the number of taxpayers whose returns are simple enough. The law itself doesn’t say anything about who can take advantage of these free offerings, of course. Yet under this law, a majority of taxpayers who previously claimed itemized deductions will no longer do so. You claim itemized deductions when they add up to more than the standard deduction. The new law nearly doubles the standard deduction. At the same time, it does away with some itemized deductions and imposes new limits on others, notably a $10,000 cap on state and local tax. 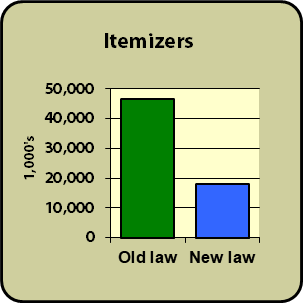 These changes are expected to reduce the number of itemizers by nearly 30 million. Eliminating Schedule A for itemized deductions won’t qualify you for a service if your return requires any other special forms or schedules. Yet it seems likely that for many of those 30 million taxpayers, this change will make the free software versions available. If itemizing was the only reason you had to pony up for a “deluxe” version of the software last year, there’s a good chance you can save as much as $80 by using a free version this year. Understand that software companies don’t offer free versions out of the goodness of their hearts. They’re looking to convert you to a paying customer. They’ll point out advantages of the paid version, which may include extended access and the ability to avoid starting from scratch when you prepare your return the following year. They may offer you a loan against your refund, and the loan may be misleadingly described as interest-free, when in reality the fee you’d pay amounts to a high rate of interest. Be prepared to resist enticing, overpriced offers. The software providers may suggest that the free version is best for renters, and that you’re better off with a deluxe version if you own a home. Owning a home shouldn’t disqualify you from using the free version, though, so long as you know you won’t be itemizing. Under prior law, a majority of homeowners were itemizers, but that’s no longer true. These three providers all offer high quality service. TurboTax has the highest name recognition, so they put the tightest restrictions on their free offerings and the highest prices on their fee-based offerings. H&R Block is next, and TaxAct generally offers the most while charging least. Note: There are other providers and some may be worth considering. We omit them because we haven’t reviewed them, not because they are necessarily a bad choice. You’ll see a total of twelve offers if you visit the IRS Free File Portal . If this looks like a fit, visit the IRS Free File Portal and look for their offering in the list of software providers. If you don’t fit, but have a simple return, check out the TurboTax Free Edition. If this looks like a fit, visit the IRS Free File Portal and look for their offering in the list of software providers. If you don’t fit, but have a simple return, check out the H&R Block Free Edition. If this looks like a fit, visit the IRS Free File Portal and look for their offering in the list of software providers. If you don’t fit, but have a simple return, check out the TaxAct Free Edition.